This article analyzes the relationship between subjective well-being (SWB) and participation in neighborhood associations (NHA) in Japan. While the theoretical and empirical literature suggests a strong positive correlation between participation in NHAs and SWB, recent research on Japan could not validate this result. 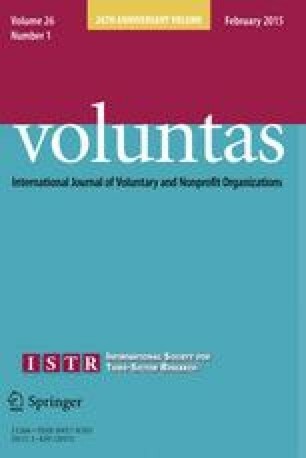 This study shows how those diverging results can be explained by including two factors in the analysis: the voluntariness of the action as well as loneliness as a mediating variable. Using linear regression models on data from two different studies, we find that—even in the case of Japan—voluntary participation in NHAs is positively associated with SWB in two ways: directly and indirectly mediated by loneliness. This result is robust to differently sampled data and different measures of our key variables. Cet article analyse la relation entre le bien-être subjectif (BES) et la participation à des associations de quartier au Japon. Si la littérature théorique et empirique laisse entendre une corrélation fortement positive entre la participation à des associations de quartier et le BES, des recherches récentes sur le Japon n’ont pas pu valider ce résultat. La présente étude montre comment ces résultats divergents peuvent s’expliquer en intégrant deux facteurs dans l’analyse: le caractère volontaire de l’action ainsi que la solitude comme variable médiatrice. En utilisant des modèles de régression linéaire sur les données issues de deux études différentes, nous constatons que – même dans le cas du Japon – la participation volontaire dans les associations de quartier est associée de manière positive au BES de deux façons: directement et indirectement induite par la solitude. Ce résultat est fiable pour les différentes données de l’échantillon et les différentes mesures de nos variables clés. Dieser Beitrag untersucht die Beziehung zwischen subjektivem Wohlbefinden und der Partizipation an Nachbarschaftsvereinigungen in Japan. Während in der theoretischen und empirischen Literatur eine starke positive Wechselbeziehung zwischen der Teilnahme an Nachbarschaftsvereinigungen und dem subjektiven Wohlbefinden nahe gelegt wird, konnten kürzliche Studien zu Japan dieses Ergebnis nicht bestätigen. Die vorliegende Studie zeigt, wie sich die abweichenden Ergebnisse erklären lassen, indem die Analyse zwei Faktoren berücksichtigt: die Freiwilligkeit der Handlung sowie Einsamkeit als eine Mediatorvariable. Nach Anwendung linearer Regressionsmodelle auf Daten aus zwei verschiedenen Studien stellen wir fest, dass - auch im Fall von Japan - eine freiwillige Teilnahme an Nachbarschaftsvereinigungen auf zweierlei Weise mit dem subjektiven Wohlbefinden positiv in Verbindung steht, und zwar direkt und indirekt beeinflusst durch Einsamkeit. Dieses Ergebnis bleibt auch bei unterschiedlich erfassten Daten und unterschiedlichen Messungen unserer Schlüsselvariablen bestehen. El presente artículo analiza la relación entre el bienestar subjetivo (SWB, del inglés subjective well-being) y la participación en asociaciones vecinales (NHA, del inglés neighborhood associations) en Japón. Aunque el material publicado teórico y empírico sugiere una fuerte correlación positiva entre la participación en NHA y SWB, investigaciones recientes sobre Japón podrían no validar este resultado. El presente estudio muestra cómo dichos resultados divergentes pueden ser explicados mediante la inclusión de dos factores en el análisis: la voluntariedad de la acción, así como también la soledad como variable mediadora. Utilizando modelos de regresión lineal en datos procedentes de dos estudios diferentes, encontramos que - incluso en el caso de Japón - la participación voluntaria en NHA se asocia de manera positiva al SWB de dos formas: bajo la mediación directa e indirecta de la soledad. Este resultado es sólido para datos de muestreo diferentes y diferentes mediciones de nuestras variables claves. تحلل هذه المقالة العلاقة بين الرفاهية الذاتية (SWB)والمشاركة في جمعيات الحي (NHAs) في اليابان. بينما تشير الأدبيات النظرية والتجريبية على وجود علاقة إيجابية قوية بين المشاركة في جمعيات الحي (NHAs) و الرفاهية الذاتية (SWB)، البحوث التي أجريت مؤخرا˝ على اليابان لم تتمكن من إثبات صحة هذه النتيجة. تبين هذه الدراسة كيف أن هذه النتائج المتباينة يمكن شرحها عن طريق تضمين إثنين من العوامل في التحليل : التطوع للعمل وكذلك الشعور بالوحدة كمتغير توسطي. بإستخدام نماذج الإنحدارالخطي على بيانات من دراستين مختلفتين، نجد أن-حتى في حالة اليابان- المشاركة التطوعية في جمعيات الحي (NHAs) ترتبط بشكل إيجابي مع الرفاهية الذاتية (SWB)بطريقتين: مباشرة وغير مباشرة بوساطة من الشعور بالوحدة. هذه النتيجة هي قوية لبيانات العينة بشكل مختلف وتدابير مختلفة من المتغيرات الرئيسية لدينا. We are grateful to the Cabinet Office of the Government of Japan for providing us with the raw data of the National Survey on Lifestyle Preferences 2011. This project on neighborhood associations in Japan would not have been possible without the generous support of the German Institute for Japanese Studies (DIJ). Any errors or opinions are ours alone. See Tables 6, 7, 8, and 9 and Figs. 6, 7. Baum, C. F., & Schaffer, M. E. (2012). Instrumental variables estimation using heteroskedasticity-based instruments. http://repec.org/usug2012/UK12_baum.pdf. Dolan, P., Layard, R., & Metcalfe, R. (2011). Measuring subjective well-being for public policy. Office for National Statistics. http://www.ons.gov.uk/ons/dcp171776_257882.pdf. Tiefenbach, T., & Kohlbacher, F. (2013). Happiness from the viewpoint of economics: Findings from recent survey data in Japan. German Institute for Japanese Studies (DIJ working paper, 13/1). http://www.dijtokyo.org/publications//WP1301_Tiefenbach_Kohlbacher.pdf. Tiefenbach, T., & Kohlbacher, F. (2014). Happiness in Japan in times of upheaval: Empirical evidence from the national survey on lifestyle preferences. Journal of Happiness Studies. doi: 10.1007/s10902-014-9512-9. World Economic Forum. (2013). The Global Gender Gap Report 2013. Available online at http://www3.weforum.org/docs/WEF_GenderGap_Report_2013.pdf.